If you’re the salad-bringer in your family or circle of friends – this one’s for you. It’s super easy and also really super bright & flavorful. It goes great with whatever you’re grilling and packs up well for picnics. 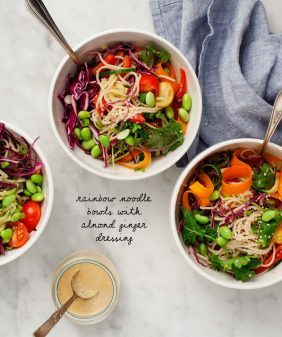 You can make it in advance which, in my opinion, is a key element to summer salad-ing. 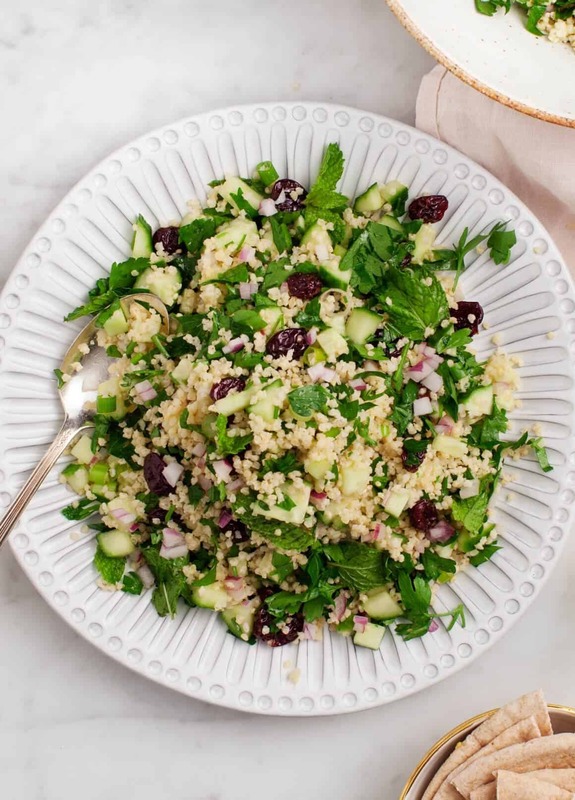 This is not a traditional tabbouleh because, as you see, I’m using dried tart cherries (which are also sometimes called sour cherries) in lieu of tomatoes. 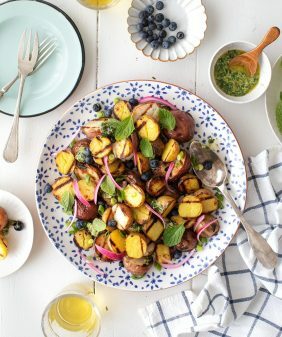 I just love the pop of sweet bright flavor they bring here – it contrasts so nicely with the earthy flavors of the herbs and it balances so well with the tang of the lemon juice. For this post, we’re working with the Cherry Marketing Institute. If you haven’t heard, I’m pretty obsessed with Montmorency tart cherries (see all previous recipes here). As their name suggests, they bring a pop of tart flavor to so many dishes, and I love the challenge of creatively working them into various types of recipes. They also have some great health benefits – they’re known to help with muscle soreness after a workout and studies have shown that they can help with sleep since they’re a natural source of melatonin. Give these superfruits a try if you haven’t already! I find mine in the bulk bins at Whole Foods, some of you have also mentioned that they can be found at Costco. Tabbouleh is traditionally made with bulgur but I used millet here because it’s gluten free and the texture is pretty similar. I’ve included cooking methods for both in the notes of the recipe. I mixed the millet with tons of herbs, diced cucumber, red onion, and scallions. 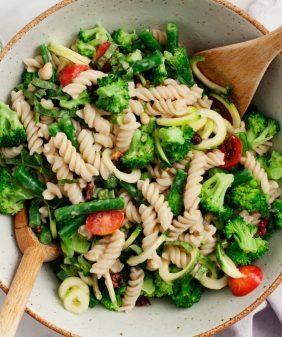 It’s simply seasoned with lemon juice, olive oil, sea salt, and a touch of white wine vinegar – mix it all in one bowl and serve. 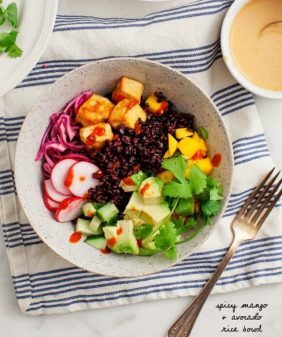 As I type this I’m trying to hold myself back from finishing the leftovers in the fridge – this salad is especially good on the 2nd day when the flavors have had the chance to mesh together. Add the rinsed millet to a dry pot. Over medium heat, toast for 1 to 2 minutes. Stir, add water, olive oil and salt and bring to a boil. Cover, reduce heat, and simmer for 15 minutes. Remove from the heat and let sit, covered, for 10 more minutes. Stir in the garlic, fluff with a fork and set aside to cool. 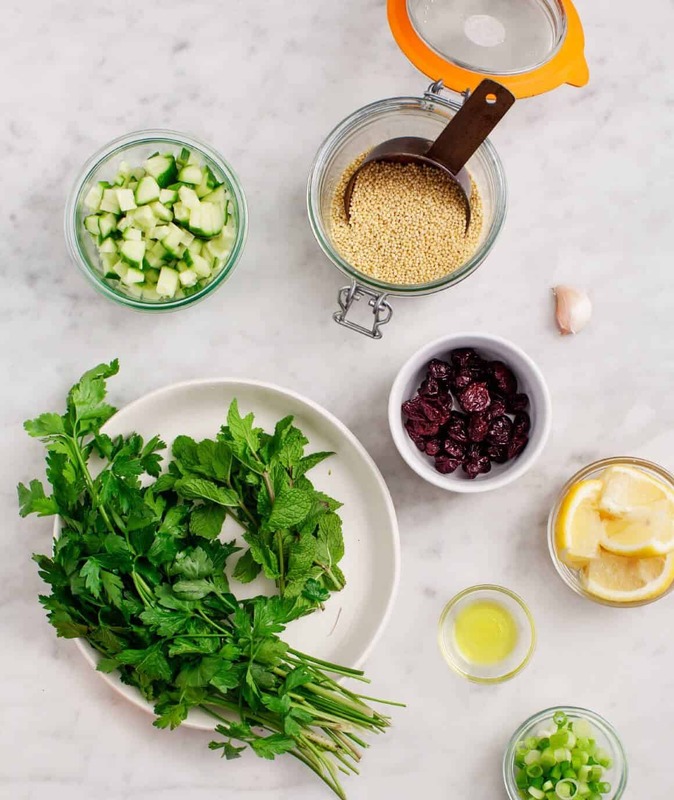 In a large bowl, combine the cooked millet with the cherries, scallions, cucumber, parsley, and mint and toss. Add the olive oil, lemon juice, 1 tablespoon of the white wine vinegar, salt and pepper and stir again. Taste and adjust seasonings, adding additional vinegar for more pop, or more salt and pepper if desired. Serve or store in an airtight container in the fridge for up to 2 days. *Note: If using bulgur: Bring 1¼ cups water to a boil, add the bulger, turn off the heat, cover and set aside for 25 to 30 minutes or until the liquid is absorbed. Stir in the garlic, fluff with a fork, and set aside to cool. What a beautiful, simple meal. Those dried tart cherries sound absolutely divine and perfect for this dish. I haven’t cooked with millet in awhile, but I’ve enjoyed it in the past – I will need to try this soon! Yum! I am all about cherries right now! I’d be tempted to use fresh cherries, since they’re in season. Another plus for this salad: you don’t have to worry about it turning bad if not kept cold enough, like salads with mayo. 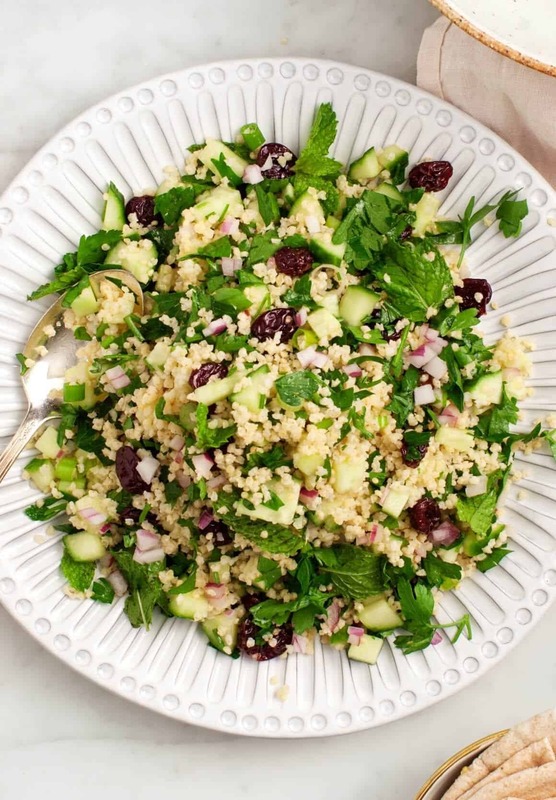 Love the addition of tart cherries to this tabbouleh! Sounds like the perfect picnic lunch. Such a great idea – can’t wait to try it! I will try it next week when I have my family over. They will love it! This is such a delicious salad and I’m happy I have leftovers. It’s just what I needed after a long trip home and a long time away from home. I used fresh cherries instead of dried though because they looked so good at the farmer’s market this morning. And aside from the pre-rinse, what’s your trick to keeping the grains of millet separate and preventing them from clumping and getting sticky. Hi Katie – I’m so glad you liked it! When I’m done cooking my millet, I spread it out on a large plate instead of letting it sit in the pot, and then I sort of break any clumps up with my hands. Thanks for pointing this out – I’ll include that tip in the recipe! That’s such a good idea. Thanks for the tip! i do not have any millet, was wondering if couscous would be an okay substitution..? Hi Sarah – yep, you could use couscous (just be sure to cook it differently than the instructions I’ve listed). I love this! I’ve been making cherry dishes all summer but I like that the idea of utilizing dried cherries! do you think i could use dried cranberry instead of cherries ? 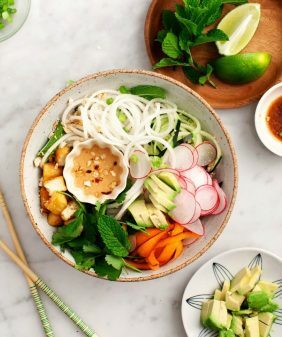 Love this salad – one of my go-to’s now.